Images by Taylor & Porter. Well hello again and it’s just wonderful to be back on Coco. How have the last few months been for you? I hope that your wedding plans are all falling into place and the prospect of the big day is making you very happy indeed. Now, given that I’m the founder of The Bridal Edit, it probably won’t come as a surprise when I tell you I’m here to talk about wedding dresses. Let’s start with sample sales and the first thing I should do is explain exactly what they are. Well, bridal boutiques have to buy all those gowns that you see hanging on rails when you visit. These sample gowns are ordered from new designer collections and each boutique holds examples of the gowns that they think will be most popular with their clients. But, as designers release their new collections, boutiques have to buy in more samples of the latest designs to make sure that they’re always offering you the latest, and most gorgeous, selection of gowns. Now, given that the boutique has had to buy in these gowns AND given the fact that they’re beautiful and amazing dresses, there’s just no way that these dresses can be simply thrown away. Instead, boutiques will hold Sample Sales to sell off these dresses at greatly reduced prices. So, this is the time to secure your dream dress without blowing your budget. Stay up to date with the latest news from boutiques that you’re interested in. Most will announce upcoming sale dates via their social channels so get following and keep your eyes open. When a sale’s announced, get in there quickly if the boutique’s operating by appointment only. It can definitely be worth an early start or a day off work to make sure that you get first pick of the available gowns. Do your research before you go. Sample sales work best if you already know what dress, or at least what designer, you’re interested in. Sales really aren’t the best place to try on gowns for the first time and appointments on sale days are usually shorted than at other times. Check the small print of the sale before you go – do you have to take your gown away with you at the time? Will you have to pay in full straight away? Can you take anyone with your or are numbers limited? Check everything out beforehand so you know exactly where you stand. If there’s a particular dress that you’re interested in, ask the boutique for more details. What condition is it in? Will it be cleaned before you take it home? Remember that these dresses will have been tried on during lots of appointments so expecting your dream dress to be pristine might be asking too much. Don’t forget to think about alterations. It’s highly likely that you’ll need to have at least some alterations made after you’ve purchased your dress. Will the boutique arrange for these for you or will you need to make your own arrangements with a seamstress? Don’t forget to find out how much these might cost to make sure you’re still on budget. Go to the sale prepared to buy. This isn’t the time to browse or take too much time to make up your mind – the next bride through the door might snap up the very gown you’ve just tried on. Be decisive otherwise you might lose your dress. You should still expect great service from your boutique, even during a sample sale. Just be clear about their terms and the way they work their sales. Remember that you’re still buying your wedding dress and it should be a fantastic experience. Trunk Shows are, quite simply, your chance to see a designer’s entire collection at your boutique. It’s important to remember when you’re dress shopping that it’s highly unlikely that a boutique will hold the entirety of a designer’s collection. Most boutiques have to balance a number of designers in their space and so the majority will select their own edit of gowns to stock. This edit will usually include the dresses that the boutique think will be most popular with their clients or styles they know will attract the attention of brides to be. As you can imagine, when some designer collections include large numbers of designs, there will be some gowns that just don’t make this edit. But this is where Trunk Shows come in because for a short period of time, usually a long weekend, a boutique will bring in all the dresses from a designer collection so you get the full designer experience. All the dresses from one designer in one place, just for you. What could be better? Again, keep your diary up to date. Designers promote their trunk shows as do the boutiques themselves. Look out for details so that you can secure your appointment. When you book your appointment, don’t forget to check the details. How long does your appointment last? How many friends can you bring with you? 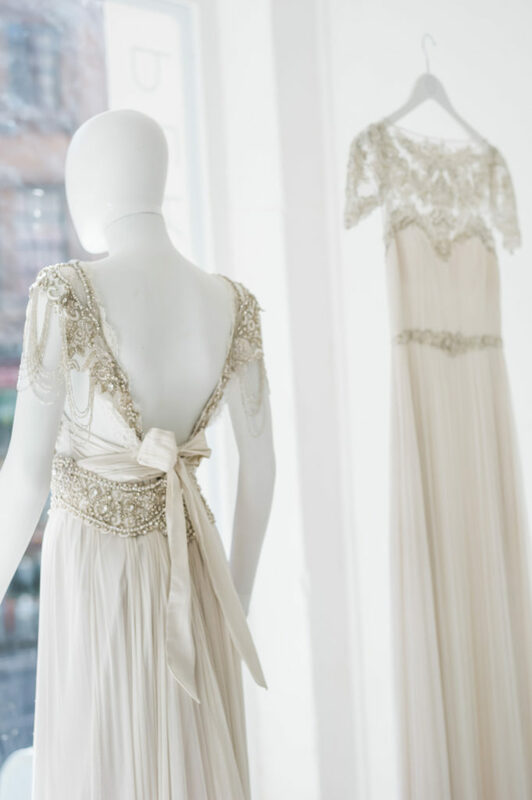 Trunk Shows are definitely less rushed than Sample Sales but do ask in case appointments have had to be shortened to meet the demand from brides. Lots of boutiques offer a discount on dresses ordered at a Trunk Show so again, be decisive if you want to benefit from this. Of course, there’s no pressure to buy if you don’t want to and certainly no need to make quick decisions here unlike at Sample Sales. Your dress will still be ordered as normal from the designer so Trunk Show orders are subject to the same lead times as when you buy from the boutique during their ‘normal’ times. If you’re looking for a gown quickly, a Sample Sale is a better option (or ask about express ordering at your boutique but be aware this might be subject to an additional cost). If you want to order, you’ll usually be subject to the boutique’s standard payment terms so expect to have to pay a deposit, particularly if you want to benefit from any Trunk Show incentives. Some Trunk Shows include visits from the designer themselves or their team and these can be fabulous experiences! 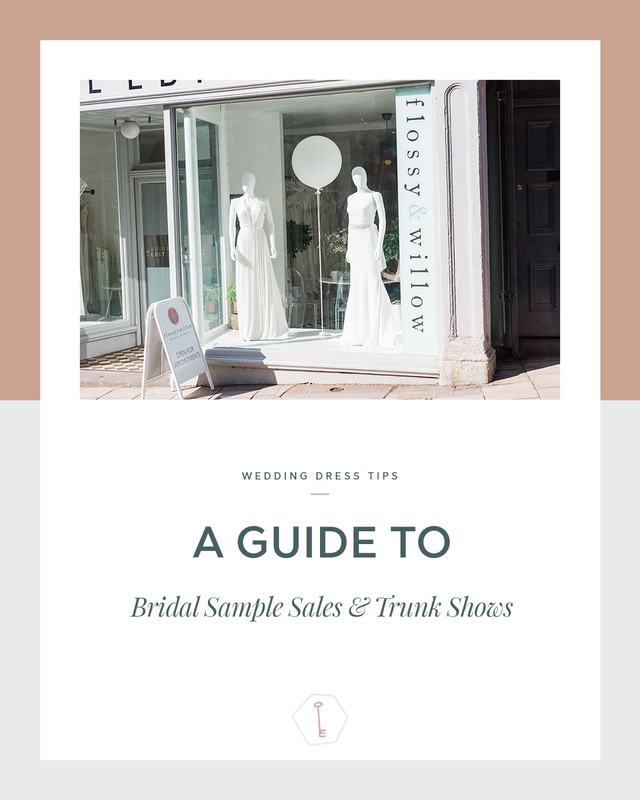 And there we have it – Sample Sales and Trunk Shows in a bridal nutshell! Enjoy shopping and whenever you find your dress, don’t forget those celebratory bubbles! The Bridal Edit is where the bridal and high fashion worlds collide. They give you access to the very best bridal fashion around whenever you want it. Dress, designers plus their edit of essential additions are all right at your fingertips.